MBT shoes are physiological footwear--the first footwear that has a positive effect on the entire body. MBT stands for "Masai Barefoot Technology." Their innovative design includes a multi-layered, curved sole which makes for a unique and rewarding walking experience. The key to MBT is its patented sole structure. The shank, PU midsole with Pivot and the Masai Sensor create a soft surface that is akin to walking barefoot on springy moss or on a sandy beach. This creates a natural instability underfoot, which activates the supporting muscle system and has positive effects on the entire body. Wearing MBTs significantly improves your gait and posture and relieves pressure on your joints and back. It also exercises a large number of muscles, whether you�re walking or standing. This, in turn, stimulates your metabolism, burns extra calories and speeds up muscle regeneration. In addition, MBTs can have a firming effect on abdominal, leg and buttock muscles. 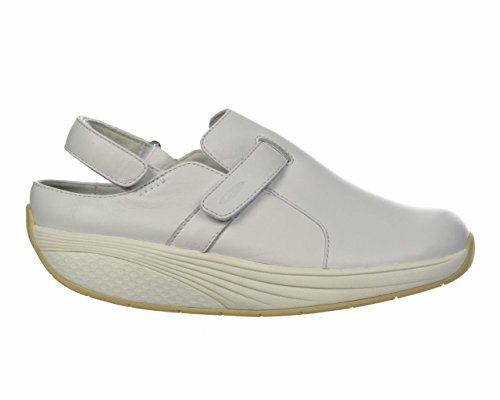 Wearing MBT shoes can also be a therapeutic tool for back, hip, leg and foot problems. At MBT they don't believe in shoes. They believe in footwear that makes you better from the ground up. Heel Measures Approximately 1.5", Platform Measures Approximately 0.75"